I am teaching myself how to make uncooked foods with a bit of texture that can be a boon to a raw food diet. 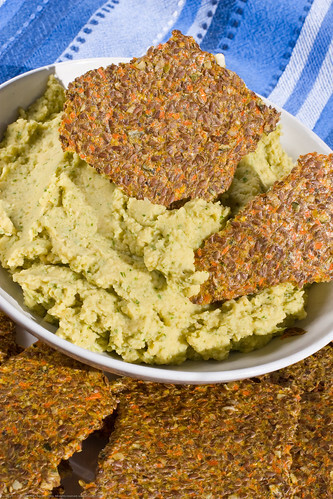 The following recipe that I concocted myself uses a dehydrator but you could use a low temp oven instead (unless you live in the humid south like New Orleans where mold grows just about anywhere). If you try these let me know how it goes for you! I call them Beta Flax because they contain raw carrot – beta carotene! In a large bowl, add water to flax seeds and allow to hydrate for 1 – 2 hours. In a food processor, grate carrots with grater attachment. Replace grater attachment with the blade. Add garlic, sunflower seeds, pumpkin seeds, lemon juice, hydrated flax seeds. Pulse the mixture and continue until flax seeds begin to break up and a dough begins to form, might take a few minutes (10?). 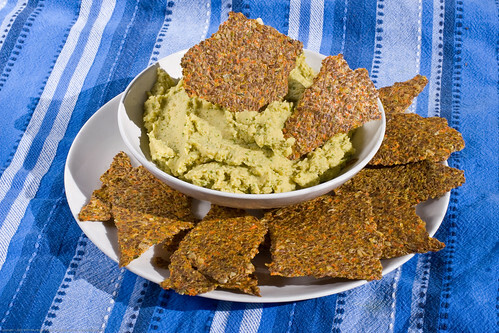 Using an offset spatula, spread the mixture onto paraflexx sheets and put into the dehydrator overnight. The first 2 hours can be at 135F and then put to 115F for the overnight. Occasionally take out trays and rotate them. Half way through process, flip the crackers so moist undersides can also dry. Allow to cool and then store in a cool dark place in a ziptop bag. Enjoy with all sorts of dips, as part of a savory mille-feuille, as a salad adornment, totally up to your imagination! Looks yummy! I have just become acquainted with the whole notion of eating all raw foods. It was Susan Schenck’s book, “The Live Food Factor,” that made me change my ways. I was totally skeptical til I read this book. I realize now how much better I feel everyday. Thanks for the great recipe. I am definitely going to try it. Leonel: wow, that looks like a neat site – will check it all out! Becky: let me know if you like it once you make it! rawdoctors.com They also have recipes, health news and lots of videos. Is there a compromise for people without dehydrators, or who don’t want to leave the oven on 100 degrees all day? Could I just heat them on about 250 for a few hours instead? I’d love to hear your advice.